In an SEC Form 4 filing after the market closed today, Berkshire Hathaway (Ted Weschler) reported a $42 million increase in its stake in Liberty Media SiriusXM Group (LSXMA and LSXMK) at $41.53 – $41.64 per share on May 26. 30, and 31, 2017. Berkshire has now added $214 million to its $1.25 billion stake in Liberty Media SiriusXM Group since May 15. The New York Post has an article today about Verizon’s potential interest in acquiring SiriusXM Group. Berkshire Hathaway has purchased a 3% stake in German specialty chemicals maker Lanxess. Previously, Berkshire acquired Detlev Louis, a German motorcycle apparel and accessories retailer and Wilhelm Schulz GmbH, a German maker of piping components. In an SEC Form 4 filing after the market closed today, Berkshire Hathaway (Ted Weschler) reported a $40 million increase in its stake in Liberty Media SiriusXM Group (LSXMA and LSXMK) at $38.93 – $40.12 per share on May 23. 24, and 25, 2017. Berkshire has now added $172 million to its $1.25 billion stake in Liberty Media SiriusXM Group since May 15. I am quoted in this Chicago Tribune article: “Working at Kraft Heinz means competition, cost-cutting, and for some, reward”. “I think (Kraft Heinz) has had a beneficial impact throughout the industry, pressuring other companies to operate more efficiently. … The downside, of course, is when you go to zero-based budgeting, some jobs will be lost,” said David Kass, a finance professor at the Robert H. Smith School of Business at the University of Maryland, who is also a Kraft Heinz shareholder. Will Kraft Heinz Acquire Colgate-Palmolive or Mondelez International? Uncategorized Comments Off on Will Kraft Heinz Acquire Colgate-Palmolive or Mondelez International? I am quoted in a TheStreet.com article on the possibility of Kraft Heinz acquiring Colgate-Palmolive or Mondelez International. Cook’s comments, reported by the New York Post, suggest there’s a strong possibility that a friendly deal for Colgate-Palmolive could be struck reasonably soon, said David Kass, a clinical professor at the University of Maryland’s business school who follows Buffett and his company, Berkshire Hathaway (BRK.A) . The New York-based company could be attractive to Kraft Heinz, 3G Capital or Berkshire, Kass said. One possibility is Buffett and 3G partnering to finance Kraft’s purchase of Colgate-Palmolive for as much as $85 billion, a premium on the company’s current $65 billion market capitalization, Kass suggested. That theory is buoyed by the fact that Buffett and 3G have worked together before — on the purchase of Heinz, which predated its merger with Kraft. The combined company also has some synergies with Colgate-Palmolive. Colgate garners a large percentage of its sales outside the U.S., and it could use its international distribution chain as a channel for Kraft-Heinz, which has a much smaller international presence. The merged companies would also benefit from some economies of scale with U.S. retailers that sell both Colgate’s household products and Kraft Heinz’s food and beverages. In an SEC Form 4 filing after the market closed today, Berkshire Hathaway (Ted Weschler) reported a $45 million increase in its stake in Liberty Media SiriusXM Group (LSXMA and LSXMK) at $36.80 – $38.50 per share on May 18, 19, and 22, 2017. Berkshire has now added $132 million to its $1.25 billion stake in Liberty Media SiriusXM Group since May 15. In an SEC Form 4 filing after the market closed on May 17, Berkshire Hathaway (Ted Weschler) reported an $87 million increase in its stake in Liberty Media SiriusXM Group (LSXMA and LSXMK) at $36.44 – $36.67 per share on May 15, 16, and 17, 2017. In an SEC 13F filing after the market closed today, Berkshire Hathaway reported several major changes in its portfolio, including a $20 billion position in Apple (129 million shares at closing price of $155.70) and a large reduction in its investment in IBM, both of which were revealed earlier. Berkshire also disclosed a 50%, or $500 million, increase in its stake in Bank of New York Mellon, as well as the elimination of its $250 million position in 21st Century Fox. There were also minor changes made to its almost $10 billion investment in the four major U.S. airlines (American, Delta, Southwest, and United Continental). Health insurance – not the U.S. tax code – is “crippling our business around the world,” Warren Buffett said during Berkshire Hathaway’s annual shareholder meeting on May 6, 2017, in Omaha. In what New York Times columnist Andrew Ross Sorkin described as a “blunt” and “implicit rebuke” of his fellow chief executives, Berkshire Chairman Buffett said business leaders would be smart to shift their focus away from their tax bills and toward health care costs, which have been rising at an alarming rate, devouring profits. He blasted the recently passed U.S. House bill to repeal and replace Obamacare, and touted the broad benefits of a single-payer or universal type of health coverage for all U.S. citizens, perhaps with an opt-out provision that would allow the wealthy to choose a more bespoke plan. 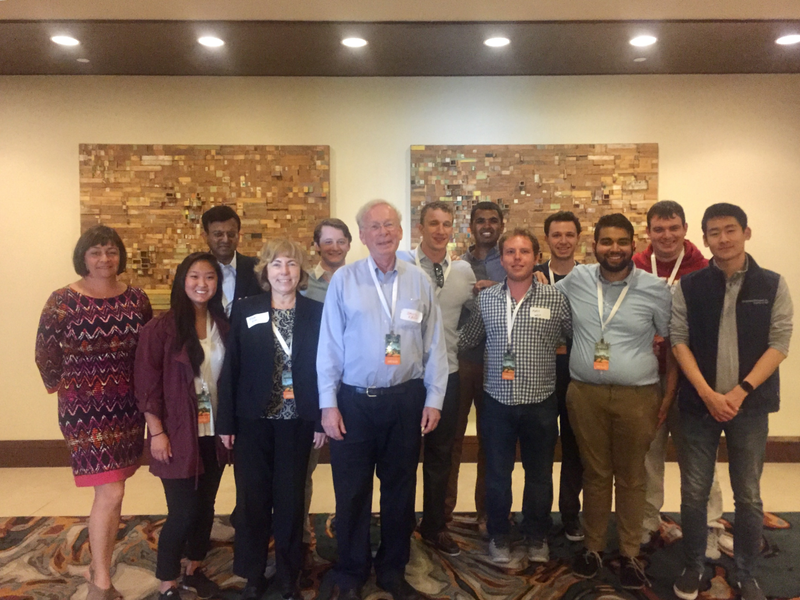 Clinical Professor of Finance David Kass at the University of Maryland’s Robert H. Smith School of Business attended the Berkshire meeting, along with faculty colleagues Elinda Kiss and Julie Pavlovsky, and 10 Smith finance students. The annual meeting is an annual tradition for Kass, who has taken students to the “Woodstock of Capitalism” for the past 10 years. Buffett told the crowd last weekend in Omaha that the healthcare overhaul bill provides a big tax cut for those who earn more than $250,000 per year from capital gains and would result in a 17 percent tax cut for him – roughly $680,000 of the $4 million in taxes that he paid in 2016. Corporate taxes, he said, have declined over the past 50 years to 2 percent of gross domestic product, from 4 percent. Berkshire Vice Chairman Charlie Munger referred to the overutilization of medical services for people he described as “almost dead,” Kass said. Munger gave an example of a Texas hospital where, he said, surgeons provide heart surgery to healthy patients. The outcomes of these surgeries are typically good, Munger explained, since the patients didn’t need heart procedures to begin with. Kass is a former health economist for the Federal Government (Federal Trade Commission, General Accounting Office, Department of Defense and Bureau of Economic Analysis) and has closely followed Buffett’s investments and philosophy for more than 35 years. He weighs in on Buffett’s views on the healthcare and tax overhaul issues facing U.S. companies. The tradition of U.S. corporations providing health insurance, tax free, to employees originated with World War II-era wage and price controls, Kass says. Companies at the time circumvented controls to compete for workers by offering health insurance. “The Affordable Care Act (ACA), requiring large employers to provide health insurance, continued this tradition,” Kass says. “Healthcare may be judged in terms of cost, quality and access,” he adds.